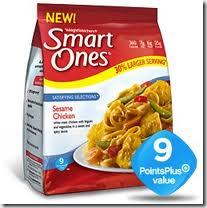 Smart Ones Entrees $0.95 at Target! Target is having a sale right now when you buy 12 Weight Watchers Smart Ones Frozen Entrees,Combine the Target Coupon with Manufacturer Coupon to crab each item for $0.95! 1.Weight Watchers Smart Ones Frozen Entrees for $1.94. La Victoria Soft Taco Tortillas Only $0.78 at Rite Aid! Kashi Steam Meals Only $1.49 at Target!